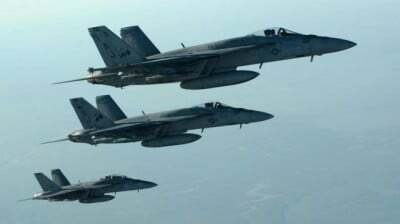 The US has begun bombing Iraq and Syria in the name of fighting the self-declared Islamic State. But is the real goal targeting the ISIL? Jennifer Psaki (US Department of State Spokesperson): Our objectives here are going after the threat of ISIL, the safe havens where ISIL has in Syria. There will be other towns and cities that we know will be threatened in Syria, but we have to focus on our strategic components here, which are command and control centers, which are oil refineries, which are other pieces where we’ve done our precision strikes over the past several weeks. QUESTION: So saving people – saving innocent lives from this – from ISIL, which you’ve called barbaric and evil and everything else under the sun, is not as – is just not a priority? More than a decade after the US and its coalition allies promoted and pursued a military campaign in Iraq, a new campaign is being launched. This time, the rationale (excuse) is not weapons of mass destruction. The casus belli in this case is the need to control and contain the threat posed by a group dubbed the Islamic State in Iraq and the Levant (ISIL). Formerly known as al-Qaeda in Iraq, the profile of the militants has increased over the past several months in the wake of their conquest of strategic territory within a broad swath of Iraq and Syria. Most notably, the group’s reputation for barbarism has been underscored by a number of high profile beheadings, in recent months. While this broadcast was aired, the Kurdish city of Kobani on the Turkish-Syria border is at risk of falling before the repressive ISIL insurgents. While the need to respond to the threat posed by the Islamic State is understandable, at least two questions need to be addressed as Western leaders agitate for military aggression in the region. 1) Is the US bombing campaign currently underway effectively eroding the Islamic State militants’ ability to threaten civilians in the region and abroad? 2) Given the US is no stranger to evoking phony pre-texts for war, is the need “to eliminate the terrorist group ISIL and the threat they pose to Iraq, the region and the wider international community,” the true reason for Operation Inherent Resolve, as it’s now being called? This week’s Global Research News Hour centres on the US coalition’s current military mobilization against the entity known as ISIL/ISIS, the likely objectives and propsects for success with two geo-political analysts. Lawrence Wilkerson is a Visiting Professor of Government and Public Policy at The College of William and Mary in Virginia. He formerly served as Chief of staff to Secretary of State Colin Powell. Global Research News Hour contributor Jon Wilson interviewed the US Army Veteran following a speech he gave at the University of Winnipeg on ISIS and the Middle East. Wilkerson attempts to explain the US strategy, his contention of it being fueled by a Sunni-Shia split within Iraq, and his prescription for the prospects for success. Mahdi Darius Nazemroaya is an award-winning author, geopolitical analyst, sociologist, and frequent contributor to Global Research. His view is that the operation against the so-called Islamic State is largely a smokescreen and puts forward his thesis that a larger regional power grab is the ultimate goal for the US. Nazemroaya will be holding workshops at the World Peace Forum Society’s 7th Annual Teach-In, Oct. 25, 2014, at the Simon Fraser University Harbour Centre, 515 West Hastings, Vancouver. For more details, please visit www.peaceforumteachin.org. Julie Lévesque is an independent Journalist and Associate Editor at Global Research focussing on the complex dynamics of this new offensive. Corrections: Israel Shahak is the translator of “The Zionist Plan for the Middle East” and not the author; Ariel Sharon in 1982 was Israel’s Defence Minister. He became Prime Minister in 2001.